But rotten isn’t always bad. If nothing ever rotted, nothing could live. Decomposition seems like the last stop on the food chain, but it’s just the beginning. When dead things rot, they give life to a host of other creatures. So who are these decomposers? Sharks and vultures feast on animal carcasses. Worms, maggots and dung beetles devour decaying plant and animal matter. Decomposition is happening everywhere: oceans, forests, in your backyard—even between your teeth! It’s nature’s way of creating energy for all living things. So unplug your nose! Open this book to uncover the dirty rotten truth about one of nature’s most fascinating processes. 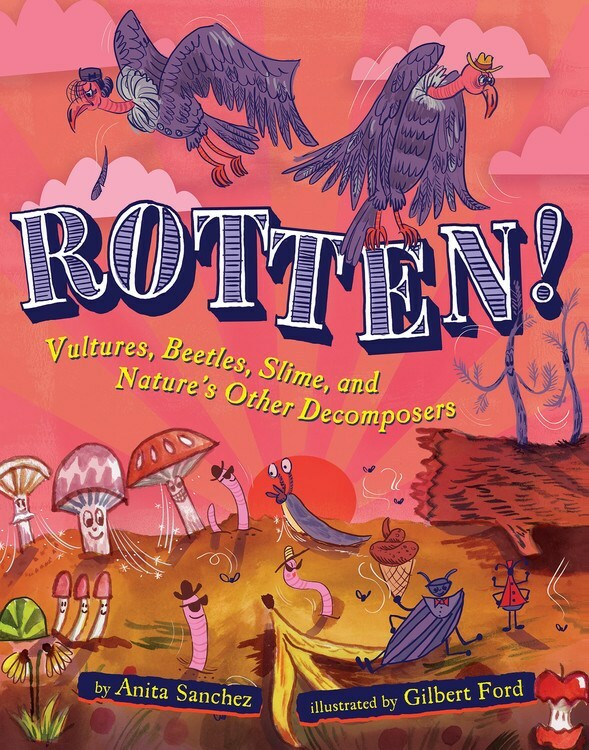 A funny and fact-filled look at decomposition in all of its slimy glory, illustrated with dazzling full-color art by Gilbert Ford. Vultures, fungi, dung beetles, and more aid in this fascinating and sometimes smelly aspect of the life cycle that’s right under our noses. Everything in the world—a beetle, a tree, a whale—is made of atoms of elements like carbon, oxygen, and nitrogen. Think of a jigsaw puzzle made up of billions of pieces, tiny and complex, perfectly fitting into each other. But what do you do with the puzzle when it’s finished? You have to take it apart to use the pieces again. Decomposition is the process of breaking something down into its pieces. And as the bug, tree, or whale decomposes, all the uncountable billions of atoms that made up its structure are freed, ready to create new patterns. Let’s follow a single atom of nitrogen in the soil of a meadow. One sunny day, the nitrogen is absorbed by a root, and becomes part of a blade of grass. A deer bites the grass, swallows, and down goes the nitrogen into the deer’s stomach. The nitrogen is absorbed and becomes part of the deer’s body, maybe a muscle cell in the leg. After a hard winter, the deer dies. Its body decomposes, rotting away into the dirt. It’s sad, smelly—and yucky! But the nitrogen atom sinks back into the soil. In spring, it’s sucked up by a root. The fresh, green grass is eaten by a hungry fawn, and nature’s cycle starts again. Decomposition isn’t always ugly and disgusting. And, believe it or not, it isn’t always smelly. So unplug your nose! Get ready to take a trip into the world of rotten. Sometimes it’s a gross journey—but not always. Like new grass springing from the remains of a dead animal, decomposition can seem almost…magical. In a shadowy Egyptian tomb, a priest bends over the mummy of a Pharaoh, chanting magic spells as he winds linen strips around the body. Among the strips, he places amulets shaped like lions or cobras, to protect the king on his perilous journey to the afterlife. 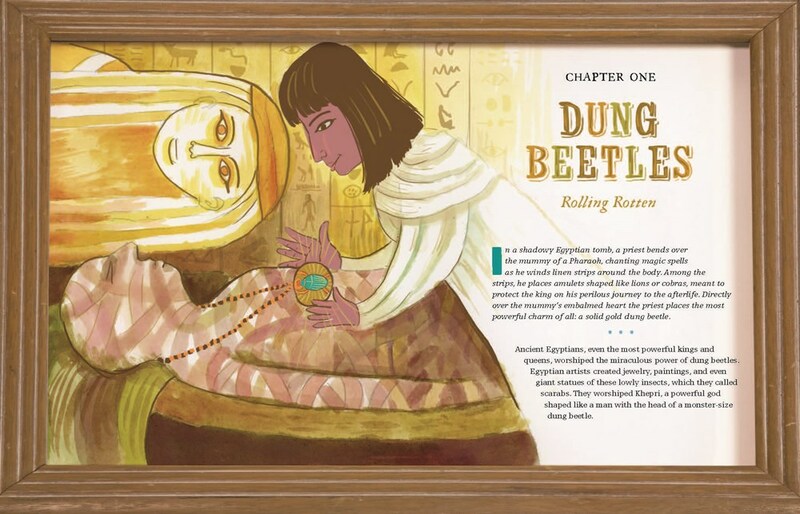 Directly over the mummy’s embalmed heart, the priest places the most powerful charm of all: a solid gold dung beetle. Ancient Egyptians, even the most powerful kings and queens, worshipped the miraculous power of dung beetles. Egyptian artists created jewelry, paintings, and even giant statues of these lowly insects, which they called scarabs. They worshipped Khepri, a powerful god shaped like a man with the head of a monster-sized dung beetle. But why did they adore bugs that eat poop? To the ancients, the scarab was a magical symbol of life triumphing over death. 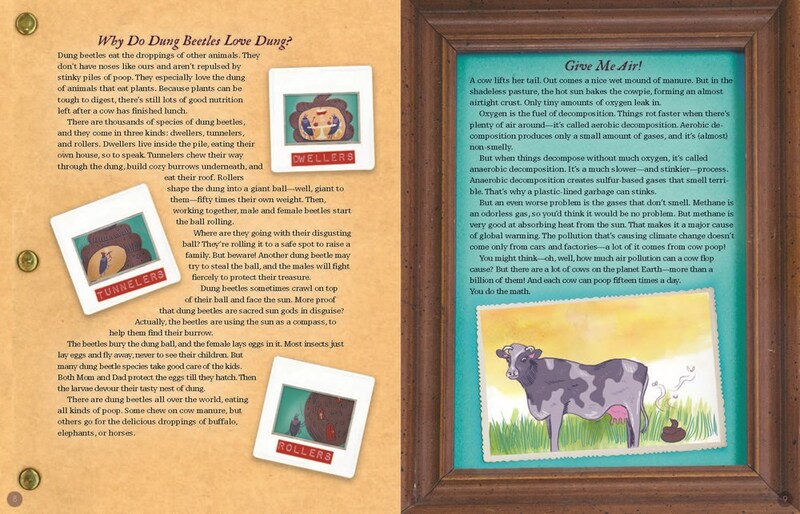 Dung beetles lay their eggs in a pile of manure, and when young beetles burst forth from a decomposing cow flop, it could seem like a miracle. Some dung beetles roll balls of dung across the ground, pushing with their hind legs. This symbolized the sun’s magical journey through the heavens. Imagine a giant dung beetle rolling a blazing sun across the sky! Dung beetles aren’t gods or miracle-workers, but these little insects have outlasted the mighty Pharoahs. Today, dung beetles are busily chewing their way through mountains of manure all over the world, and helping to solve a smelly problem facing our planet: how to decompose the poop of a billion cows.